The majority of high-achieving A-level students at comprehensive schools and colleges do not apply to top universities, often due to a lack of confidence in their academic abilities, a major government-commissioned report suggests. Good students who choose less prestigious institutions are also often concerned about the cost of living, distance from home and the job prospects associated with a course, the study found. Researchers analysed the university applications of nearly 13,500 pupils predicted at least three B grades at A level, and interviewed a sample to find out their motivations. 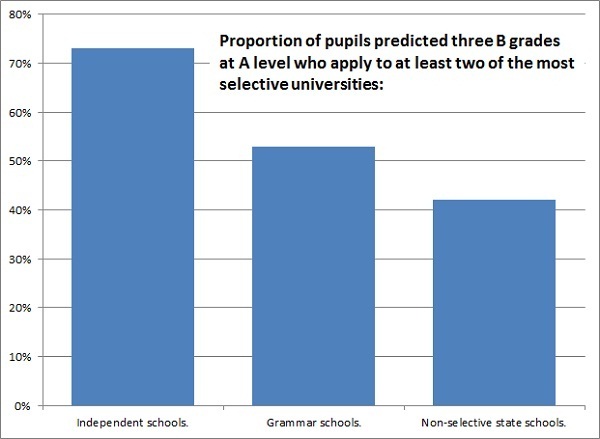 Only four in 10 comprehensive pupils applied to research-intensive Russell Group and 1994 Group universities. The report revealed that pupils who had not applied to top institutions because of a lack of confidence in their abilities often came to regret their decision.